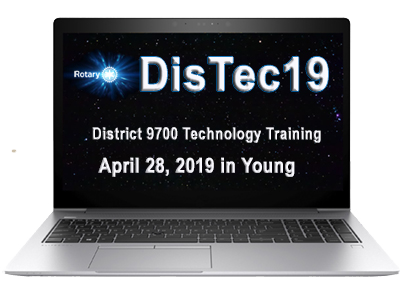 This is the home page of the 2019 District 9700 Technology Training day, being held on April 28th at Young Council hall ,189 Boorowa Street from 10 am till 4 pm in Young NSW. Registrations are open. Be quick...we are limiting registrations to 50 Rotarians. The training, materials, morning tea and lunch are free to Rotarians. Click below to experience acoustical communication (turn your speakers up). On November 12, 2017 the inaugural District Technology Training Day was held in the Young town hall. Forty-five Rotarians registered for the training and the overall assessment average of the speakers by the attendees was 4 stars out of 5. A great event to be continued. Clubrunner, Word Press very interesting. Very interested to learn Zoom and Social Media. Lots of info to practise at home . Fabulous, informative and interesting day. Well planned and implemented. Congrats! Very informative in all regards. Well planned. It was wonderful to not have endure a sausage sizzle lunch! Thank you for allowing us to have Inter District sharing. Hands on excellent. The day was pleasurable and informative. Enjoyed all activities. Would like a bit more time on GIMP. Great meeting new and old Rotarians. Well done, great day. Very well present. Congratulations. Why should your club be represented at DisTec19? It’s an exciting and adventuresome revolution, and your club can ignore it or join it. If you join it, you will grow yourself, your club image and your club membership. Knowledge is power. At DisTec18 we will be distributing knowledge free of charge. Come and get it. DisTec19 is sponsored by District 9700 and is open to all district Rotarians, however it is really all about Clubs. Our objective is to present the technology tools and technology options that will promote and grow your club.